Perhaps the biggest charm of being on vacation is that the usual rules don't apply. Normally, I try to live more or less as a responsible adult, setting some ground rules for myself. Making dessert only when we have company. Junk food rationed into small katoris. Every meal built around vegetables. That sort of thing. But once I was on that flight, all bets were off. I started breaking my rules first thing in the morning. The one about eating a wholesome breakfast did not have a chance. I ate every delicious sinful thing I was offered and then reached for seconds. Batata vada at home. These homemade batata vadas had an irresistible spicy filling and a crisp golden shell. Batata vadas (again) and sabudana vadas (as big as grapefruits!) at the beloved Hotel Prakash in Shivaji Park, Dadar. I found a great description of this eatery in this post, complete with a look at the menu and a picture of their celebrated sabudana vada. Jalebi, ganthia and patra, bought fresh by an aunt. But who would be crazy enough to eat a lurid orange deep fried syrupy sweet at 8 AM?? Everybody, as it turns out. My aunt patiently explained to me that if you don't rush to this particular famous vendor as soon as you wake up, there will be no jalebis left for you. The classic redolent-with-ghee venn pongal and crisp-as-can-be medu vada combo, made by V's mom. Puri-chhole made by a dear aunt, followed by the most divine dessert, angoor rabdi. And after this breakfast, do you want to know what I had for lunch? Biryani. Seriously. As I look at this list, I can see favorites from many regions of India- the first two are Maharashtrian classics, the third is a Gujarati favorite, the fourth is a taste of Tamilian festival food and the last is more North Indian. What follows is another breakfast that my mother rustled up one morning. I took some pictures as she was making them and thought I would share this easy "recipe", if you can call it that. Eating samosas for breakfast feels pretty darn decadent but these are not half bad- in fact, you are using up leftover whole wheat rotis and pan-frying these little treats instead of deep-frying them. So this one is a good compromise between indulgence and nutrition. All you need is some rotis. Whole wheat tortillas would be a perfect substitute. 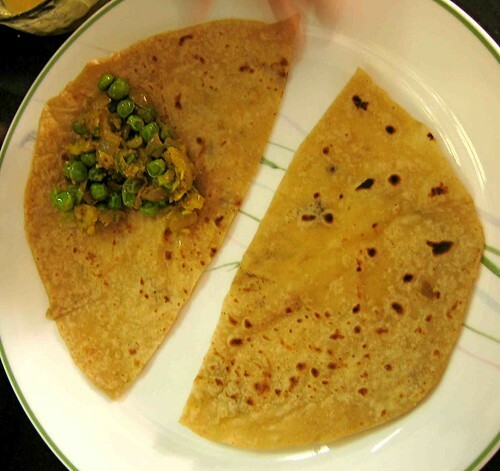 Choose any filling that you like- my mother made a quick one with onions, peas, potatoes and some spices. Leftover subzis would work just as well. To hold the samosas together, my mother uses a thick paste of chickpea flour (besan) in water, as a glue. 1. 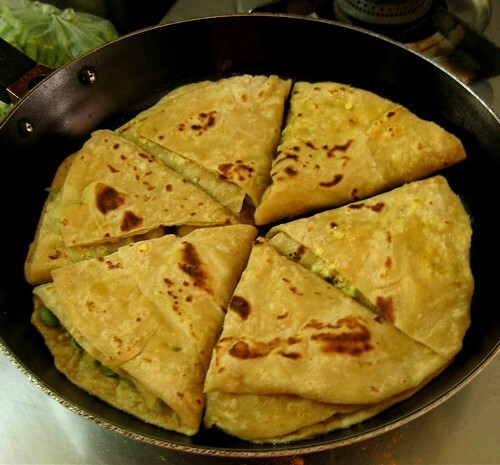 Cut chapatis (or whole wheat tortillas) into half. Place the filling in the center triangle of each half. 2. Fold in one side. Dab with the paste. You need less paste than is shown in the picture, actually. 3. Fold the other side and press down firmly. 4. Heat a pan with a drizzle of oil. Place samosas neatly around the pan. Cook on low-medium heat on each side until golden and crispy. When i first read the title, i thought it must've been part of your vacation home... but after seeing the recipe - brilliant. What a healthy way to satisfy a samosa craving. I love this idea! Inspired and delicious! 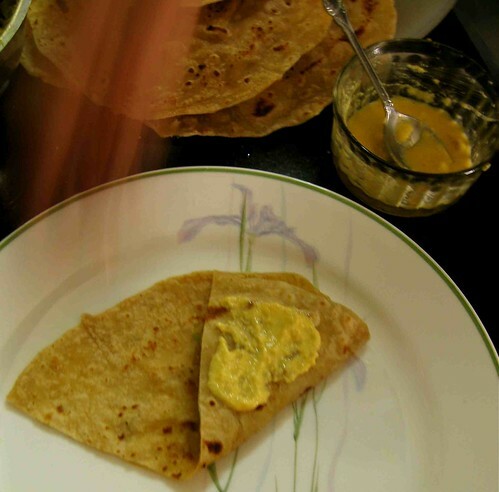 Looking great and nice clicks some times i do it with tortillas ... really mouthwatering.. can u send me one.. But chick pea glue is fantastic idea dear.. really will do it for sure next timme thanks for u and ur mother.. loved this idea so much.. so sweet..
A healthy and zatpat breakfast. I came here quickly as soon as I read your title 'Samosa' in reader. :) hmmm...nice version! I love this breakfast dish! And I saw your books! Happy reading. Jalebis and matri are my favorite breakfast, but I could get used to those samosas! I loved 'A Case of Exploding Mangoes'. The other mango book - not so much. I'd love to hear what you think of the others! Khaled Hosseini's work is amazing. I am waiting for his next book, whenever that comes out! I wish i would have been there in your place!! Lucky you to have such nice India trip!! BTW this is nice recipe of samosas!!! My MIL also makes such yummys!! What a fantastic idea, Nupur. It looks just delicious! what a treat to have those decadent, delicious snacks everyday! nice way of using up the left over veggies and samosas look heavenly, loved the stuffing!! That's wonderful idea and looks so inviting.. ....ack!!! You're killing me! I'm not on vacation, and now I want Samosas for breakfast, LOL! And the problem is, at the very thought of this-- some sort of reptilian brain has taken hold of me, and all reason has left. If there is any reason why a person should not have Samosas for breakfast every.single.day, I can no longer see it! Your recipes are always pure brilliance :) Glad that you made it back to the States safely! Looking at ur reading selection, u seem to be interested in WW-II a lot. I've read 'The house of blue mangoes' i liked it fairly. Also Khaled Hosseini's 'a thousand splendid suns'...this one touched me more deeply than 'the kite runner'...its very good! I am reading Bharati Mukherjee's 'The Tree Bride' these days, its fiction interwoven with lots of real history from the indian pre-independence era, pretty heavy too! Nupur, I am late, but so glad that you are blogging again. We do miss the breakfast food of the champions :) I just finished Daniyal Muinnuddin's short stories and am starting to read Netherland. Happy Blogging! Nupur, the minute my feet touch home my stomach takes a holiday too and enjoys every sinful delicacy any time of the day. Can't wait. As for these samosas they are a treat with nothing lost. Chaitanya- Good to know that you have read two of these, I'll let you know what I think when I get to them. Meanwhile, I finished "The Jew of home depot and other stories" by Max Apple. If you like short stories, these are a wonderful read, very kind and gentle humor and the poignancy that so often features in short stories. I also finished "The Seventh Well" by Fred Wander and it is breathtaking, utterly heartbreaking and beautiful, a holocaust novel that describes unspeakable things in poetic words. I recommend both of these. Nags-I did love Khalid Hosseini's first book and am about to start this one tonight. Amruta- No, actually, I have no specific interest in WW II. I chose these books because I read reviews of them or heard about them. It just happens to be this selection (I tend to read more of non-fiction usually and love a juicy murder mystery too). Thanks for sharing your reviews of some of these. I did read "the Tree Bride" some time ago and yes, it was interesting but very heavy on the history! Mandira- Hello :) I have not heard of either of those books and will check them out! What indulgent breakfasts Nupur. My green smoothie suddenly sounds quite blah! 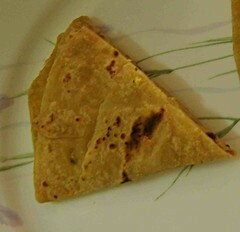 I like the easy samosa..usually make it with whole wheat tortillas..works great. PG Woodhouse's Bertie & Jeeves series is my favorite of all. Others are - The Glass Castle: A Memoir by Jeannette Walls and Blackberry Wine by Joanne Harris. 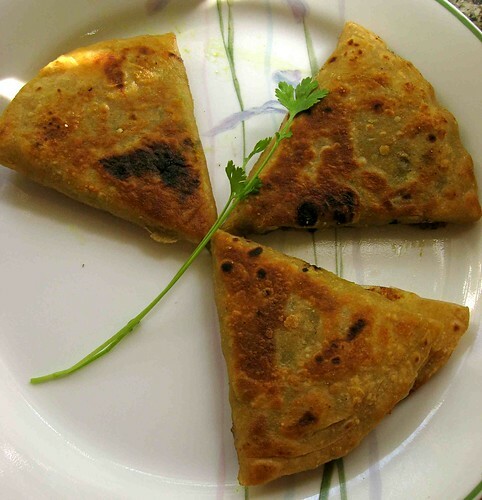 Lovely samosa recipe Nupur, glad to hear that you enjoyed your break. Mine will start in few weeks :) I am exicted at the same time scared about all the weight calories I will pack. Amazing recipe!!! It's indeed a healthy way to satisfy an unhealthy food craving!! !Way to go!! Jalebis were indeed hot breakfast items on weekends :) and so were Kachoris. Your mom is brilliant!!! Can't wait to try these. After I read Kite Runner - I was haunted by the story and I would literally start crying out of the blue for days afterwards.....I know I get really caught up in my books. So I haven't gone near Hosseini's second book. One of my new favorites is "Reason for Hope" its a memoir by Jane Goodall. I think u might like it (just based on the things u write about on ur blog). Another one I really liked is "Left to Tell" by Immaculee Ilibagiza (about surviving the Rwandan genocide). For light reading, right now I'm really into "The Ladies No 1 Detective Agency Series". It is so heartwarming and guaranteed to make u smile. Summer solstice is here now and it is 44 degrees outside. Awesome idea Nupur! Am going to use the leftovers to make the "healthy" veggie samosas today! BTW did u see Food Inc. yet..? Thats such a neat idea Nupur. I am going to make these samosas soon. Did I tell you, I am so happy you have started posting. I feel so good to read your posts. What a great way to make samosas! I'm afraid I will never make the deep fried version (more because of my aversion to deep frying than any reservations about eating them! ), so I'm happy to have this alternative which looks very doable! I haven't been reading much lately, but I did manage to fit in a little during my week off! Brill recipe!!! Thanks!! Must try this. Wonderful to read your posts again...The idea for the glue is really cool...must try this to make leftovers taste and look great ! Great idea for left-overs. And so well presented. Love your samosas! Fantastic idea! Lately, I've read A Thousand Splendid Sun (good story, but not amazing book), Sea of Poppies (stunningly written, can't wait for part 2 and 3), On Chesil Beach (very good indeed!) and A god of small things (simply fantastic! very very good indeed!). I've made some lucky choices lately, it seems! Let me know how your reading goes. hey Nupur, samosas looks toooooo good and yummy... nice idea... thanks for sharing..
Several mystery novels - I always have one or more of those going for night reading - the best of which is "Redemption Street" by Reed Farrel Coleman. Also "Standing Alone in Mecca" (Nomani) and "The Music Room" (Devidayal). holidays are for indulgences, rules breaking and forgetting there ever was such a thing as a schedule!! the samosas look great, good to use up rotis... have fun !! Thanks for mentioning the books- I should get a hold of both of them, especially "Eating India". Raaga- It is 36 degrees here and I am dying in the sweltering heat. There mere thought of 44 degree weather makes me feel faint...how on earth do you cope with it? Vani- The Great Indian Novel was too much for me...one of those books that I started but did not finish. I love non-fiction, and might I suggest a food memoir for your next read? :) I liked Madhur Jaffrey's "Climbing the Mango Trees", Sudha Koul's "The Tiger Ladies" and Julia Child's "My life in France". I was offered a complimentary ticket to see Food, Inc. but I declined. To tell you the truth, such movies are preaching to the choir since I already believe in the stuff they have to say. And they just leave me feeling hopeless and depressed. Rajitha- Since it is summer, the visitors to your NYC home must be even more frequent ;) miss your posts! Maninas- Thanks for sharing your book recommendations. I read A Thousand Splendid Sun a couple of days ago and thought it was a great story. I read Sea of Poppies last year and liked it very much. And I completely agree with you- The God of Small Things is fantastic! I'm putting On Chesil Beach on my reading list...thanks for recommending it. Diane- I love a good mystery novel! Thanks for mentioning those books...they are all new to me and I'll look for them. Nupur: Only the first one (Redemption St.) is a mystery, and if you want to read that I would highly recommend the first one in the series, "Walking The Perfect Square." 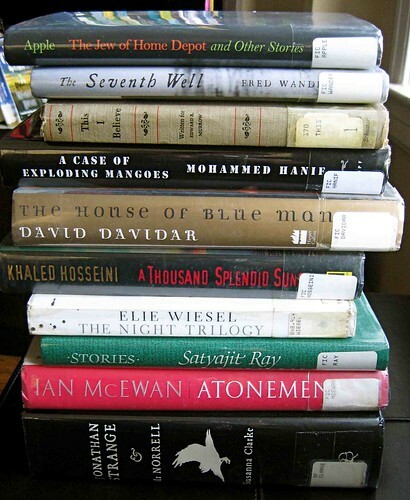 The others I listed are non-fiction. I realized after your comment that I made it sound like they are all mysteries, but they are not. It's just that I plow through mysteries at a great rate, so I always have a few of those balanced against "real" books. Enjoyed your post Nupur!! Your mention of the angoor rabdi reminded me of the amazing seetaphal rabdi I had at my sister's wedding (in December)- I don't have much of a sweet tooth (except for dark chocolate and cake maybe) but I LOVED it..
As for books, I recently finished reading the latest in the No.1 Ladies Detective Agency series (teatime for the traditionally built) and desperately want to find books in the same vein- lazy light summer reading..I have a huge list of 'not so light' reading to do (that include Middlemarch and Brothers Karamazov - both of which I started reading ages ago but never finished) , but meanwhile would love some books that I can read while eating , between work etc. (am a grad student) Any recs? I also just started this book called the Medieval Cuisine of the Islamic World (on the recommendation of another blogger) which seems very interesting and quite an easy read. What a great idea for quick samosas! They look delicious. That's a hefty reading list you have there. I'm right now savoring Joyce Carol Oates' We Were the Mulvaneys. I love her beautiful, indulgent, descriptive writing. Diane- Got it...I do the same, mysteries for light reading and then something more substantial to go with it :) I'll definitely get the book you recommended! Lavanya- Seetaphal rabdi sounds outrageously good! Let's see...books for light reading. For me, food related books often make for enjoyable lighter reading. I've enjoyed food memoirs by Madhur Jaffrey, Colette Rossant, Julia Child, Nigel Slater and Ruth Reichl. I discovered another mystery series recently that I have come to love- the Inspector Montalbano books by Andrea Camilleri. Also, I am currently enjoying short stories by Satyajit Ray- and totally recommend them for good light reading. Vaishali- I love her as well but find her writing intensely depressing more often than not! I wish I had one of those samosas right this minute for breakfast! (And I am NOT on vacation.) Thanks for sharing. And: On reading, A Thousand Splendid Suns is wonderful, I'm about halfway through it. You have quite a stack there! Dear Nupur, What a post...First a list of the yummiest snacks, then the best of samosa-for-breakfast recipe, and finally books that make for great reading. The photographs of the dish look so tempting. I am reading Tagore's stories in Hindi now...enjoying them so much. Reading Lottery by patricia wood...Have you read it??? Lovely collection of books...I have just finished reading The Storyteller's Tale by Omair Ahmed - a must read - such a slim book but so many layers! Can see you had a lot of fun with food in India. I make roti rolls or wraps and now I shall try these samosas for sure. Great breakfast idea. Quite an intersting reading list. I just re-read Robert Fulghum's books and P.G. Wodehouse's "Laughing Gas". Right now in the middle of Shashi Deshpande's "Collected Short Stories. I did finish A Thousand Splendid Suns that weekend, and yes, it is a wonderful story. Pedatha1- Tagore's stories...I don't think I have ever read them. I should look for an English translation, I'd love to read them! Priya- No, I have not read that book- do you recommend it? Miri- Thanks for mentioning that book. It sounds wonderful and I'll look for it. Aparna- I can't remember if I have read Robert Fulghum...and should look for Shashi Deshpande's books too. This is such a terrific idea and I can't thank you enough for sharing this Nupur. I used this clever concept of yours to make dosas for kids. I will post this soon. Thanks again.